It all started with Dev Anand-K. N. Singh pairing. They starred together in so many films like Baazi, Funtoosh, C.I.D and quite often in similar roles, that I thought I’ve to get this straight and watch all the movies with them. 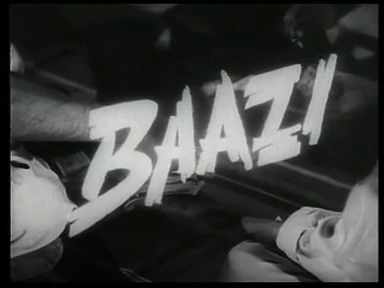 Thus to start right at the beginning I watched Baazi! And what a Baazi it is! 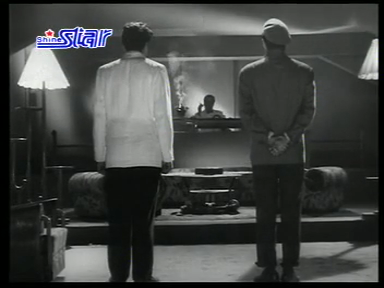 The movie begins with hands being shown gambling, just in case if we viewers missed the point. 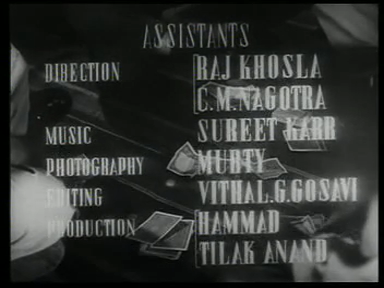 A look at the credits make you feel that the ‘who is who’ of the remaining years of the 50s are represented there. The very first scene opens with the director’s appearance, suggesting, that what you are going to see soon will all be through my eyes. 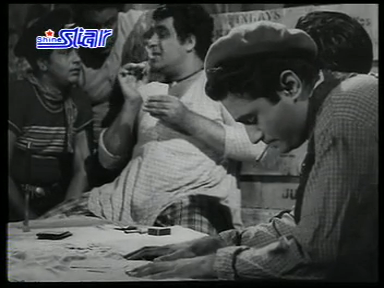 A guy named Pedro (Rashid Khan) is in search of Madan (Dev Anand), who always wins at gambling. I wonder how that is possible. But before I can think much we are already in a hotel with Leena (Geeta Bali) dancing and singing ‘sharmaye khaye, ghabraye khaye’. But it doesn’t have much effect on our hero, who was ogling at her a few minutes back and now completely offended that she made some fun at him. So when he is introduced to ‘malik’ (the lord) he is very much in bad mood and refuses to work for him. But just like many other hindi film heroes he has his Achilles heel. No, not Maa, but a sick behen (Roopa Verman). But thankfully the only time she coughs is in her first scene and then she looks quite healthy for most of the time, although she is supposedly nearer to the death than to life. Now our hero is not only too proud to take up the job at ‘malik’s place but also too proud to go to a free doctor. I think he is even too proud to take up any job. There is a new lady doctor in the town, who offers free medicine. Instead of supporting and lauding such efforts, he thinks it is better to go to the dispensary and make a nuisance of himself. In spite of all that, his neighbours think very highly of him cause he is always in the best spirits (or are the best spirits in him?). But a sick sister has to become sicker and this one loses her consciousness and this has consequences for everybody. Madan calls in Dr. Rajni and she needs, as always, injections. And we all know how expensive injections are! Madan has to go for an extra bout of gambling (Madhuri Dixit and her sisters in Bollywood had to do worse, they had to forfeit their husbands). But a loser as he his, this time he loses even in gambling this time, till his god mother comes to his rescue and the oaf runs out of the gambling den without as much as a thank you. If you had thought from now on it is walk through the greenery you are highly mistaken. Manju needs fresh air in a sanatorium in Khandala or somewhere in the Western Ghats. Rajni offers gladly to pay for it cause she loves to see Dev without a shirt. But you guessed right, he is too proud to accept money from her. So off he goes to malik and offers his services. And yeah he is too proud even too respect Leena’s love for him. I tell you, this guy is too proud to do anything but gamble. Rajni is too clever to think that Madan has earned all his riches in a respectable manner. Thus when she sees Madan in company of ‘you know what sort of’ women, she kidnaps him. Yeah, she does! And tells him, he doesn’t have to think that she is fooled and impressed by his actions. He is gambling, not for his sister, but because he loves it and he enjoys the riches. Yeah, Rajni, give him! Did I tell you that Rajni has a father (K. N. Singh) and a childhood friend Ramesh (Krishan Dhawan). Ramesh like any good Hindi film childhood friend is in love with Rajni and K. N. Singh like any good father in a Hindi movie disapproves of his daughter’s choice. It all leads to some beautiful dances (choreographer: Zohra Sehgal) by Geeta Bali and head rotations by Kalpana Kartik, while singing to soulful songs sung by Geeta Dutt (and one by Shamshad Begum) to the music by S. D. Burman. We know what happens in Hindi movies to the likes of women like Leena and we know who gets framed for that. The big question is how does apna hero come out of it? What happens to Madan’s sister. Have you noticed that in Hindi movies sick sisters never get raped, which is otherwise a fate quite normal for hero’s sisters? The conclusion: A disease saves a woman from sexual harassment. What I liked about the movie. Well nearly everything. The storyline with its harsh social comment, Guru Dutt’s taut direction, Balraj Sahni’s fabulous dialogues ‘… bal ki kehna chahiye juva vyapar ka doosra naam hai” (gambling is another name for business). 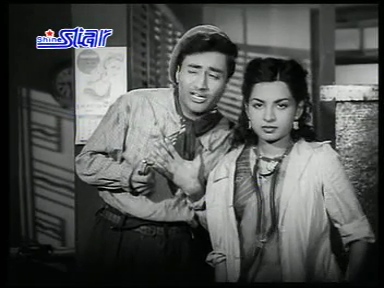 Dev Anand suits the rule to perfection and so does Geeta Bali. 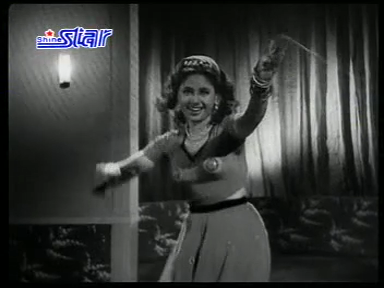 Though Geeta Bali has four beautiful songs to dance too, she gets few dialogues to mouth. Even Kalpana Kartik does a wonderful job of her role. The women in the movie are not wimpy; they take up initiative and are ready to go the extra mile for the things they love. Well, nothing. Naturally, I would have liked Geeta Bali to have more dialogues and that her character had more flesh. Rajni wearing fur and that to in Bombay! Madan: A very passive kind of guy, this! We know from his neighbour’s comments that he came form a well-off family, but after the death of his parents most probably fallen on bad times. Well I am not surprised. He tells his sis, that he goes in search of a job, but we see him only gambling all the time. I think he is what Rajni describes him. He just loves quick money and the comforts that come with it. For most part of the story we hear that he is too proud to this and too proud to do that. The only thing he is good at is gambling. When he is arrested, he doesn’t do anything against it. He never really tries to save himself. 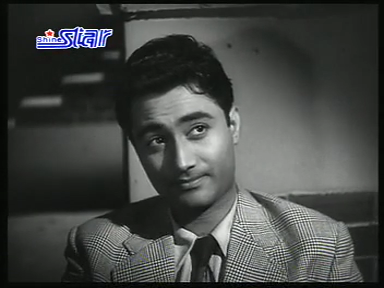 He is totally passive, quite characteristic of Guru Dutt’s heroes. Though he is clever enough to wipe his fingerprints off the murder weapon. Leena: Although she has four songs and dances, we hardly know anything of her. According to Madan she was picked up by Malik and then groomed by him and whatever she is today it is because of him. She would love to flee away with Madan. What intrigued me was, if she knew the identity of the malik? When he sits behind her and Madan in the hotel, you can feel her uneasiness. Is it just because of a stranger sitting behind them and staring at them or is she perturbed because she doesn’t understand why the malik is sitting behind them? Is she his mistress? Rajni: A daughter of the supposedly philanthropic father, who runs a free dispensary in a poor part of the city. We see her struggling with her patients, because she speaks a different language than they, though both of them are speaking Hindi. Not only Madan makes fun of her but also instigates others to do the same. The main question is why does she love Madan? Most probably because she likes his care-free nature, his smile and his looks! He does look handsome! She doesn’t accept her father’s orders not to meet Madan. And like any good Hindi film heroine she does have her dose of ‘rona dhona’. Malik: A cardboard character, characteristically well-played by K. N. Singh. He is evil. He sits like the devil in his hell with fumes of cigarette and from an unknown source keeping him company. There is nothing complex about him. 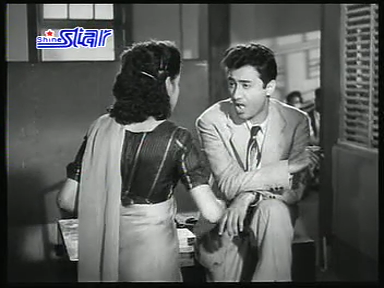 Ramesh: Rajni’s childhood friend, who is pining for her. He is the only really active man in the whole story. Every other person with the exception maybe of Malik has seemed to deliver him/herself to fate and waiting for their end. He is the guy who moves the plot ahead. Thus he stays in quite a contrast to the character of Madan, which makes him very attractive. I would have liked if Balraj Sahni himself had played this role. I was wondering if Madan-Rajni jodi had a future. Would he be able to find a job? What would stop him from gambling again? Will Rajni then turn to Ramesh for solace? I am so glad you began a movie blog! 🙂 Good for the rest of us who love movies. And Baazi is a good way to start. I don’t really remember very much of this film, except for Tadbeer se bigdi hui, and Dev Anand looking sulkily belligerent in places. Must rewatch it sometime. Frankly, of the Dev Anand-Kalpana Karthik films, the one I like most was Nau Do Gyarah – it’s so entertaining and so bereft of rona-dhona. “Rajni offers gladly to pay for it cause she loves to see Dev without a shirt.” – It MUST be true love then. I’ve seen a screencap of shirtless Dev A, and its not exactly a pretty sight. This one has been in my to-watch pile forever, but somehow never makes it into my DVD player. Will try to get it in, soon! @ bollyviewer: Thanks, bollyviewer! Dev looks so fabulous here! And his ‘sulkily belligerent’ (copyright: dustedoff) suits him quite well. Geeta Bali’s chulbulapan is so infectious and she gives her role real depth. Dev looks so skinny without his shirt! You are right, that must have been the litmus test for Rajni’s love for him! Do watch it and tell me what you think of it! Thanks dustedoff! The way you write your blog entries, your way of expression (for e.g., sulikiy belligerent) and your encouragement has really inspired me to start thsi blog! Thanks! Well, it is more like C.I.D. but for the fact that in C.I.D. 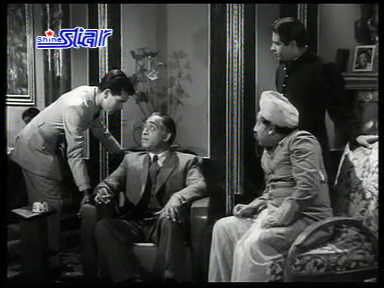 the gambling streak of Madan’s is done away with and converted into Ramesh’s inpector role. And what an oldie to start with. Baazi has been a fim I always skip over when ordering films, because I had no idea about it. >the most evergreen of Bollywood’s legends, in his green years. Now I’m going to get it. O yeah, you should watch it! I loved it. It is fast, entertaining and no csp. The songs are well-integrated, except maybe for “aaj ki raat piya”. The direction is good, the dialogues are great (funny to hear “ishwar ke liye” instead of “bhagwan ke liye”. no big dishum-dishum. She dances like a dream! Thanks for the wishes and visiting! I’m planning a Guru Dutt series. Let us see! >I’m planning a Guru Dutt series. I’m looking forward to your reviews as they are among my favourites. I am very glad that you have begun a filmi-blog. And like bollyviewer said – what a start! I haven’t seen this movie yet but it sounds a lot like CID. And I like the songs. 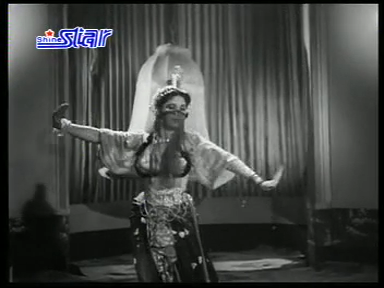 I think Baazi was the prototype for lots of films in the 50s. First I thought I will review all the similar films, but I think I’ll start with Guru Dutt series. Expect Baaz after Baazi! Thanks for your lovely compliment! And thanks for noticing the remake-cast recommendation! I hope you will get to see this movie soon. 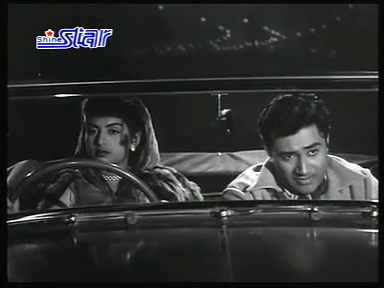 It is the baap of all noir films in the 50s! Nice to see that you dropped by! Nice to see another blog dealing with old Bollywood movies. It is your first post and I must say you have made a stunning debut. Best of luck ! I hope that this blog will go from strength to strength in the days to come. Stumbled here by following a bunch of links. I’ve seen your comments elsewhere. Nice start on your new blog with Dev. Anyone can like Dev no? Just curious, do you understand hindi dialogue? I saw your comment on “ishwar vs bhagwan”. I’m still learning hindi but it is a lot better than it was 6 months ago thanks to Dharam and the rest. Thanks for droping by Sophy! Dev is soooo handsome, I know! Practically drool over him! So you are learning Hindi. That’s great! I have met Afghanis and South Indians, who learnt Hindi only through watching Hindi films! So you are in a good circle! Do visit when you have time! Harvey, I actually hate Bollywood Hindi but since I’m not around Indians, I have no other option. I knew a little Hindi as a kid so it wasn’t like I was learning from scratch. 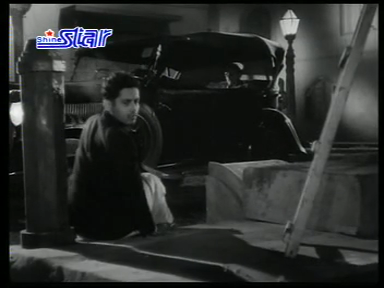 guru dutt ist fad. ich bin eingeschlafen. ich riskiere hier zwar mein leben (vor allem mein kulinarisches), aber ich will lieber LAGAAN sehen! dani, du bekommst keine dodaks mehr! dani, you can forget your dodaks, if you say Guru Dutt is boring! He is sexist, conservative, and lots of other things, but he is not boring!